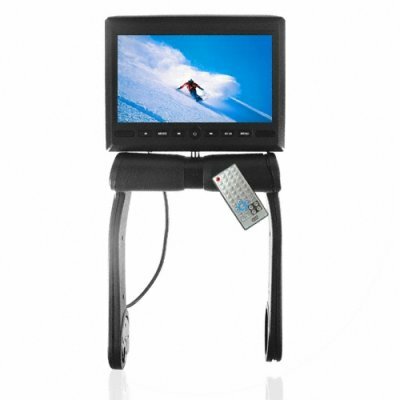 Successfully Added 7 Inch TFT LCD Armrest Monitor With Built In DVD Player -Black to your Shopping Cart. Chinavasion is proud to bring you this new adjustable armrest TFT LCD screen with a built in DVD player and speakers. Back seat passengers will love this convenient new place to put your car entertainment center, and with the built in DVD player and speakers they can enjoy movies during the long car trips. It also features USB and SD card ports and a FM audio output as well as an adjustable distance between 15.5cm to 21cm letting it fit most armrests all over the world. To make the most of those long times spent in the car, get the CVECL-7808-B and start letting your family enjoy some entertainment while you concentrate on the road ahead. In stock now for single piece or bulk orders. Delivery is very prompt. Goods comes without problem. Installation is quite simple but you still need to drill holes in the 2 sides of armrest. Playing VCD and DVD without problem (but have not tried different region code yet). Video input is also working great. FM audio is great so I don't need to connect wire. Manual needs better picture for installation. So far it is great, but i'm wondering if you have it in beige color and grey!!! !